Palestinian membership in the ICC is bad for Israel, the United States, and those who profess to want a Palestinian state. With the "State of Palestine" officially becoming a member of the International Criminal Court (ICC) in The Hague on April 1, the murky peace process with Israel just became cloudier. While the move clearly appears damaging to Israel, it is also bad for the United States, the ICC, and those who profess to want a Palestinian state. At its core, the Palestinians' plan is to gain statehood by pursuing their version of international justice and legitimacy, without negotiating with Israel. This decision represents an evolution in Palestinian strategy. They've learned from their negotiating experience at Camp David in 2000 that it is better not to show up, than to show up, reject offers out of hand, and take the blame for the collapse of the peace process. At first glance, the stars appear aligned in favor of such a dramatic move. President Obama has long been at odds with Israeli Prime Minister, Benjamin (Bibi) Netanyahu, and that chasm has only widened since the latter's re-election. The president chose that opportunity to manufacture a new crisis in the U.S.-Israel relationship, calling for a reassessment of United States support at the United Nations. With Netanyahu's staunch opposition to an American-led deal with Iran that the prime minister declared "would threaten the survival of Israel," the bond that kept the bilateral relationship strong in previous decades is guaranteed to further fray in the coming months at a political level. By way of contrast, Mr. Obama told Palestinian leader, Mahmoud Abbas that he will never have an American administration as committed to creating a Palestinian state as his. With the president indicating he may also move to internationalize the conflict by either drafting or supporting a new UN Security Council resolution regarding statehood, the timing appears ripe to make a big international Palestinian splash. This fits neatly with Abbas' plan to circumvent direct negotiations with the Israelis altogether. After all, the Palestinian national movement has already proven unwilling to accept or make a counterproposal to the previous three Israeli offers to end the conflict in 2000, 2008, and 2014. By dragging Israel before the ICC, they hope to focus attention on their cause while publicly vilifying, isolating, and prosecuting Israel for war crimes. With an accusing spotlight on Israel, they can avoid the need to compromise. It is questionable whether or not Palestinian leaders truly believe their plan will result in their statehood. But with the peace process in a holding pattern, it doesn't matter right now. In the meantime, the "diplomatic intifada"—as one senior official in the Palestinian Liberation Organization put it—will preserve their demands should they decide to negotiate with Israel at some future point. Meanwhile, they can pocket any concessions the United States and international community extract from Israel. In this new reality, the longer the Palestinians avoid negotiating an end to the conflict, the more it raises the cost to Israel. And the best part, from their perspective, is that it requires nothing of them. The ICC, which opened a preliminary probe into possible Israeli war crimes in January, was founded in order to try individuals who perpetrate the world's most serious crimes, such as genocide. It was not designed to become yet another politicized UN agency. Furthermore, it has no jurisdiction over countries with a functioning, independent judicial system, such as that which exists in Israel's democratic system. By taking up the Palestinian cause, the ICC is proving to be as morally skewed as the UN Commission on the Status of Women or the Geneva-based UN Human Rights Council, whose recorded obsession with Israel ignores countless critical humanitarian issues such as the slaughter of over 210,000 Syrians next door. As one analyst recently explained in Foreign Affairs, "The ICC is a weak institution; prosecuting Israel could prove fatal." Notwithstanding President Obama's personal irritation with Bibi Netanyahu, U.S. Ambassador to the United Nations Samantha Power declared America's "absolutely adamant" opposition to the Palestinian plan to join the ICC. The State Department likewise called it a "counterproductive" move that "badly damages the atmosphere with the very people with whom they ultimately need to make peace." Although not a party to the ICC, the United States is not without leverage should it seek to minimize the ICC's role and direct Palestinians back to the negotiating table. It can encourage its allies abroad to curb their funding of the ICC and urge them to proclaim that they do not accept the Palestinians' membership, or recognize their statehood, or consent to the ICC's jurisdiction over the matter. At home, another option is expanding the American Service Members' Protection Act of 2002. It currently authorizes the president to use all necessary means to free U.S. personnel detained by the ICC and it could be extended to include America's allies. Lawmakers could also increase the number of bilateral Article 98 agreements it has with other countries, which obliges them not to hand over U.S. personnel to the ICC. The point is to make it even more difficult for the ICC to engage in political prosecutions of the United States and its allies. The United States currently provides $400 million per year to the Palestinian Authority (PA). Past attempts to leverage this aid have been unsuccessful because Washington relies on Israel's cooperation with the PA security services in the West Bank, and Hamas would be the benefactor from a collapse in security. Nevertheless, there are avenues that America can explore to increase its leverage while getting more proverbial bang for its buck. 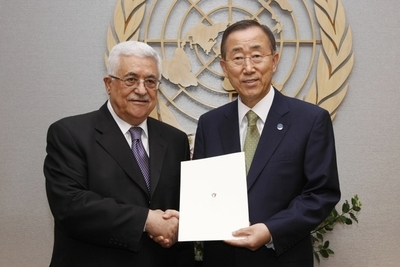 It starts with Palestinian political accountability. It is the Palestinian Liberation Organization (PLO) that is pursuing Israel at the ICC, whose unelected leaders dominate the PA. At 79 years old, Mahmoud Abbas serves as the head of both. As Jonathan Schanzer of the Foundation for Defense of Democracies pointed out in his February 4 testimony before the House Foreign Affairs Committee, the PLO's "decision-making is opaque, and its finances are obscured from the public eye. Its very existence enables a dysfunctional system." He suggests it is time to make the PLO obsolete and shut down its embassy in Washington. They must be held accountable while allowing other Palestinian leaders to emerge. Only with a reformed and accountable PA is there any hope of Palestinians building the institutions necessary to run an eventual state. Those who claim to support Palestinian statehood and back their latest initiative are doing the Palestinians a disservice. Instead of it helping to solve the conflict, it perpetuates it. Palestinians chose this path because they pay no price. That needs to change. Cynical games at the ICC, unilateral European moves, and lopsided UN resolutions that focus on Palestinian demands, while ignoring Israeli concerns, only further encourage Palestinian rejectionism.